‘Surely, the Sat Nav has taken us the wrong way?’ Mum enquired, squinting out of the window, desperately trying to spot a glimpse of the hotel peeking out above the tall hedges bordering the narrow lane… ‘The hotel can’t be down here, can it?’ And, then, as if compelled to drive towards the light, seemingly at the end of the tunnel the lane opened out to reveal the most glorious vista. ‘Ooh my’ Mum cooed. ‘Great stuff’ Dad proclaimed. ‘Woop Woop!’ I thought. 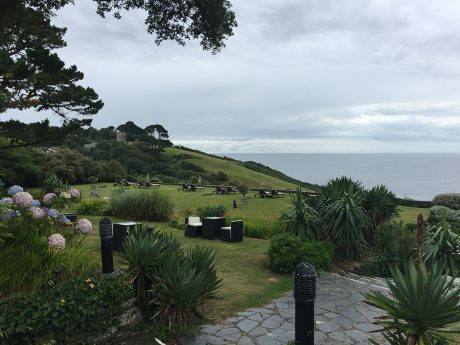 We had arrived at our destination… The Talland Bay Hotel, Porthallow in Cornwall. I’m afraid I’ve inherited the same trait as my Mum – it’s genetically impossible for us to travel light! Much to my Dad’s dismay who, as if resigned to the fact, admirably set about unloading, firstly myself, and then quickly turning his attention to tackling our copious amount of bags now bursting from every orifice of the car. 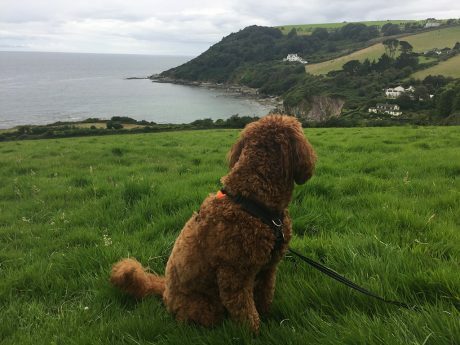 Stretching out our achy bones, we had a group hug and ‘pawsed’ for a moment to take in the magnificent view of the Bay and to deeply breathe in the fresh sea air. Invigorated, we grabbed a bag (well, my Human Parents grabbed the bags whilst I grabbed a stick) and we headed off towards reception. 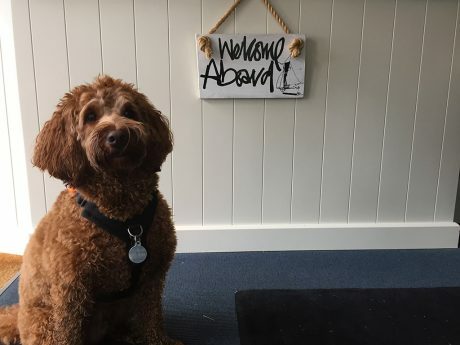 As, you may recall, I can’t read so Mum shared with me the meaning of the welcome sign that was dangling down from the reception desk, ‘Welcome Aboard!’ it declared! ‘So, this must be Basil?’ a member of staff enquired, peering over the desk. ‘Is Basil allowed a biscuit?’ No word of a lie, dinki-di, that was the very first thing they asked. Yep, I think I’m going to like it here. Welcome aboard indeed! Lovely Lucy (I call her that because she was so very lovely) showed us up to our room on the first floor where I waited patiently to go inside. 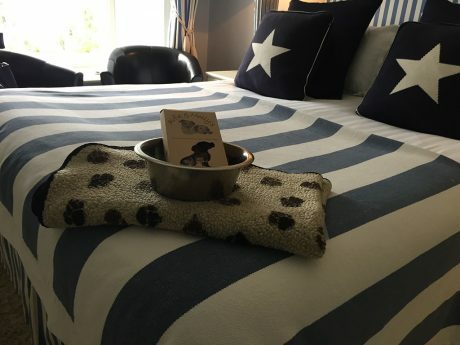 Mum was instantly drawn to the view from the window, Dad was drawn to the floor where he ceremoniously dumped our heavy bags whilst my attention was drawn to the Pamper Pack that was sitting right there on the bed! 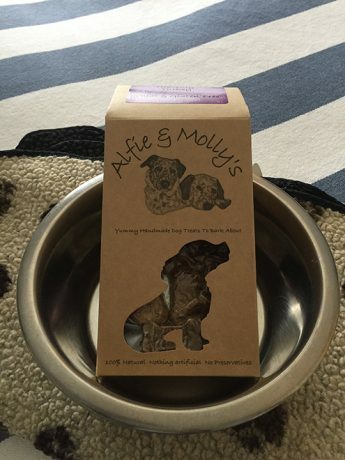 ‘Was that for me?’ A doggy blanket, feeding mat, bowl and some lovely looking treats – gluten free no less. So that’s an affirmative then! It was ALL for me! Before I could sample one of Alfie & Molly’s finest, it was time for us all to go walkabout and to take another ‘breath of fresh air’. 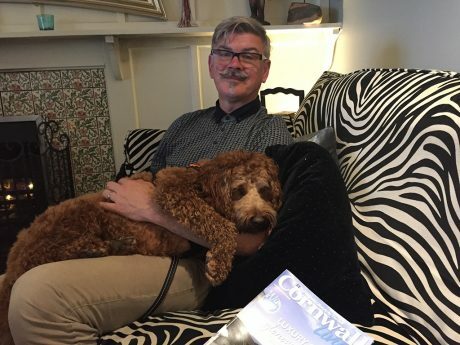 Like a litter of excited puppies, we scampered down the stairs and ran into some fellow guests and their pooch who, it would seem, had taken in enough fresh air for the afternoon and were now sitting quite happily together, absorbing the ambience of the bar; idly sipping from a glass of Prosecco. 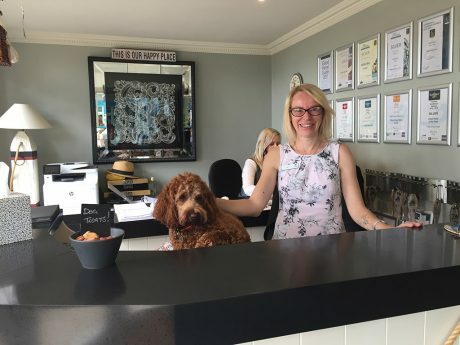 No time to dilly-dally for us though – although, I was very happy to have had a brief encounter with their lovely pooch named, funnily enough, Lucy. She, too, was also very lovely… calm and lady like… I hoped that I would get the chance to meet her again later that evening. After checking the route to the beach with Jack in reception (who had previously been sharing information of the hotel’s 65 gins with another resident) we strolled out of the hotel and headed onto a pathway which would, apparently, lead us straight down onto Talland Bay, the all year round, dog friendly, shingle beach. 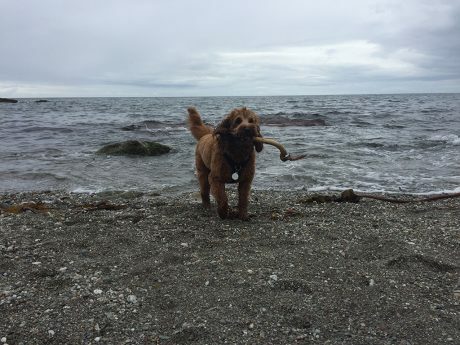 Yep… it’s a STICK! Bonzer!!! 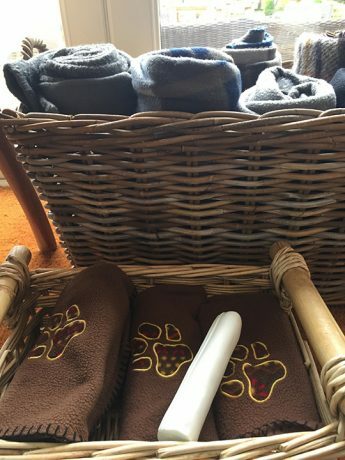 Back at the hotel, I grabbed a blanket from the basket and a treat from the treat box – looking cool (feeling it too as I had got quite wet on the beach) I laid down, as nonchalantly as I could – one eye on my kong, the other on the blanket covered sofa where Lucy was sitting… ding-dong, she was definitely making eyes at me! 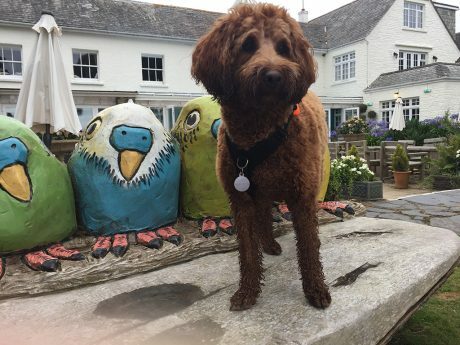 Unbeknown to my Human Parents (HPs for short) of the love affair unfurling, Dad ordered a Cornwall Knocker – say no more – whilst Mum, keen on her fruit, requested a rhubarb and ginger gin. Sipping her drink, Mum made a cuddly comment about the bracing air, the quietness of the location and how at ease we all undeniably felt within the hotel. I, too, was certainly feeling chilled! Jack offered me a treat from a bowl poised conveniently on the bar and I, ah, I’ve just put two and two together; Lucy wasn’t so much making eyes at me but was gazing at the treat bowl behind me – easy mistake to make I thought, slightly deflated by this realisation. 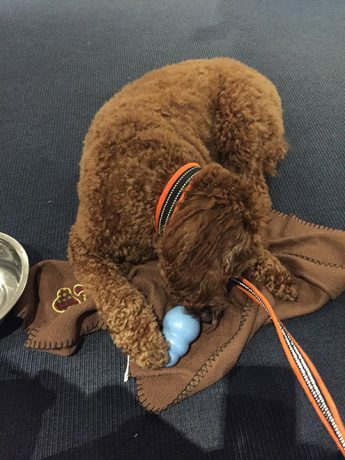 Before I had a moment to offer to share my kong, my HPs announced our departure… time to change before dinner. 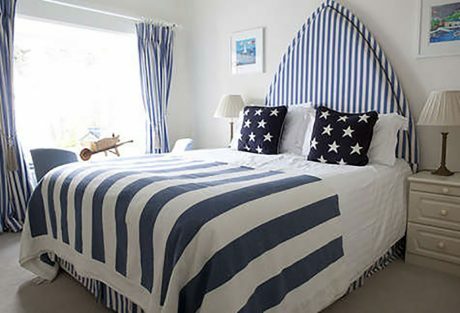 Our lovely bedroom reminded me of a ‘beach hut’ complete with nautical blue and white striped curtains and head-board. It was small yet perfectly formed and the view was just great, I could keep watch of the new arrivals AND it was a perfect viewpoint to alert my Dad to squirrels! 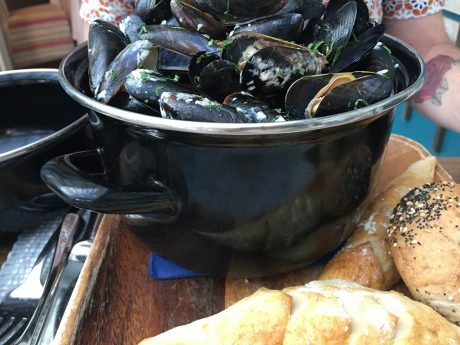 Before we could say ‘Oh I do like to be beside the seaside’ it was time for din- dins. I dressed as smartly as I could (well, my Mum brushed my coat) and we were ready to join our fellow house-mates. The lounge was a veritable dog-fest. Full of HPs and their pooches. It was great! All the guests were chatting with each other and their pooches were chillaxing next to them. I spotted Lucy as soon as I entered but ‘G’day, who’s this?’ Although I only had eyes for Lucy, I noticed a pretty looking black Labrador. 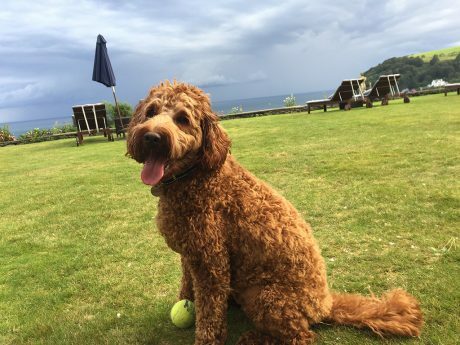 My Mum enquired after her name… ‘Nellie’. As you may recall, I am brave, ‘game as Ned Kelly’ that’s me but being in the company of these lovely ladies made me feel rather faint-hearted so I thought my best course of action was to seek reassurance and firmly sit on my Dad’s lap! 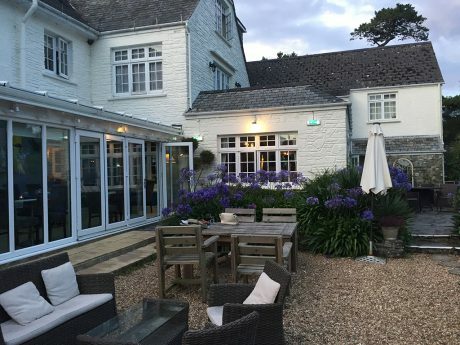 Mum was looking forward to tasting the food – we could eat in the Brasserie together so we plumped for that –my Dad shared that he had read good reports that the hotel’s Michelin trained chef, Nick Hawke, had earned two AA rosettes for his cooking. 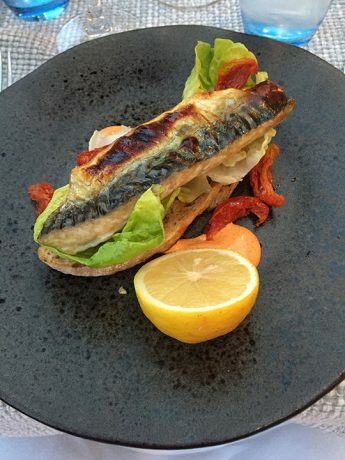 To start, Dad chose the ‘Grilled Cornish Mackerel’ whilst Mum selected the ‘Salt Baked Beetroot, Pickled Walnut and Apple Salad with glazed Goats Cheese’. 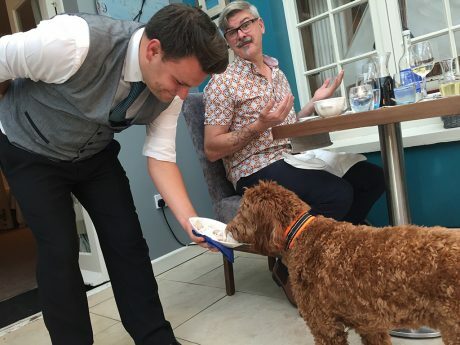 They agreed that both dishes were truly delish! After our tums were full, all the house-mates gathered in the lounge. Us pooches had had quite a full on day so we vegged out on the floor (Lucy was making eyes at me again or was it the treats behind me on the bar, it was hard to tell.) Our HPs chatted, tried the many gin options and swapped stories until the wee hours until it was time for bed. After a comfortable night’s sleep, it was brekkie time but beforehand, Dad took me out on to the front lawn for a run around, again very pleased to have found a convenient ‘poo bin’ within the grounds – although this doesn’t cut much ice with me, apparently, this is an important tick off my Dad’s ‘must have’ list! All that exercise made me hungry and back at the Brasserie the friendly waiting staff duly offered my very own freshly cooked Butchers’ banger… perfect for setting me up for the day ahead. Time to explore the area. 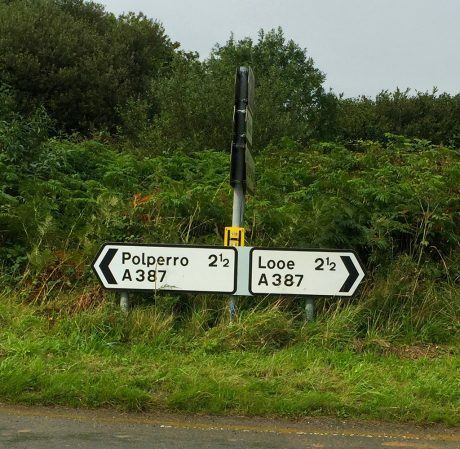 After checking with reception, Lovely Lucy informed us that we could turn left or right on the main road to visit Polperro or Looe – Polperro being the smaller fisherman’s village whilst Looe being the larger town. I gazed up at the sky and concluded that ‘she’ll be apples, she be sweet’. We set off without our sunnies but with great optimism (along with our rain-coats and brollies just in case!) Mum made a passing comment to Dad how pleased she was that she had packed for all eventualities, Dad begrudgingly nodded with grimaced acceptance. The Cornish fishing village was just lovely, very quaint. 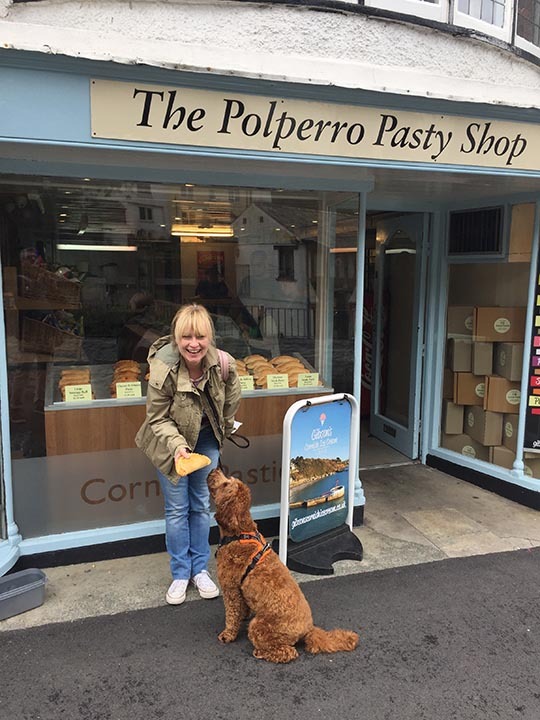 Huddled under the brolly, (see, we knew that it would come in handy) we ate our pasty – although I was only allowed a taster nibble as our vet friends had reminded my HPs that it wasn’t good for me to eat onions. 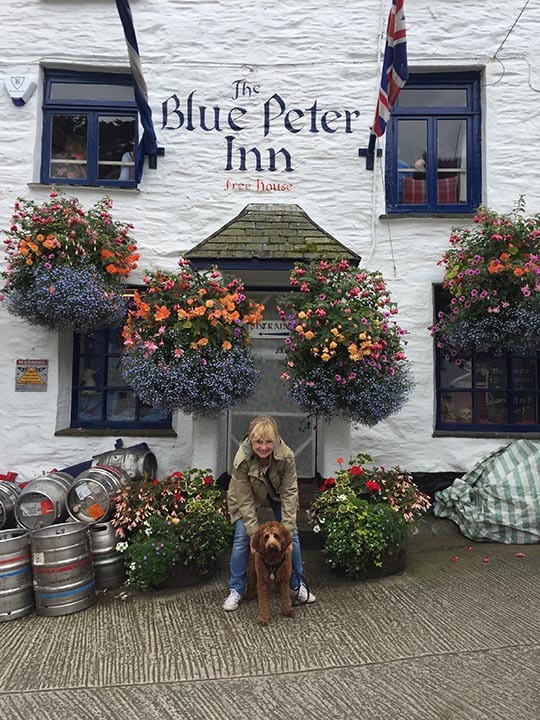 We spotted a pub that was heralded to be the ‘Best Pub in Cornwall’ where we took shelter from the English Summertime weather and even though I was wetter than a wet thing, I was made to feel more than welcome. We eventually ventured back to our second home – the sun finally came out so it was an opportunity to have some play-time on the lawn. 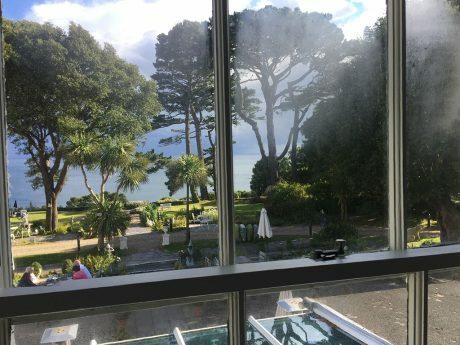 There, puffed from the exercise, we sat together on the wall facing out towards the Bay relaxing as a family, taking in that fabulous view once more before returning to our room to get ready for dinner. 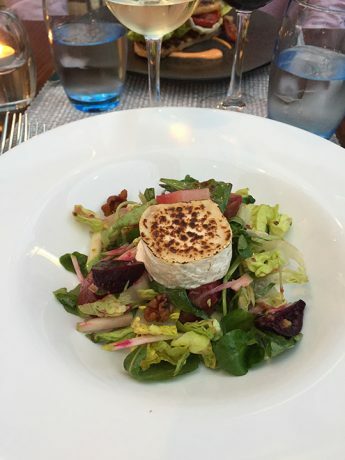 Dinner was so scrummy last night that we decided to eat together in the Brasserie again. 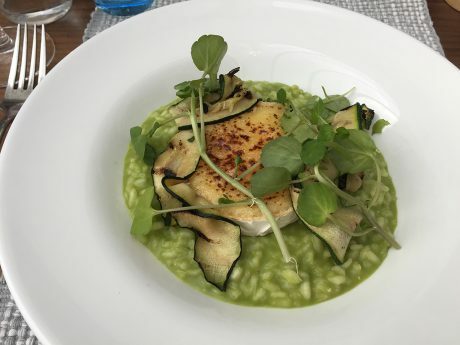 This time it was Dad who had the Mussels and Mum, well she proclaimed that she ‘simply had to have the aptly named ‘Basil Risotto’!’ Quite right I thought. 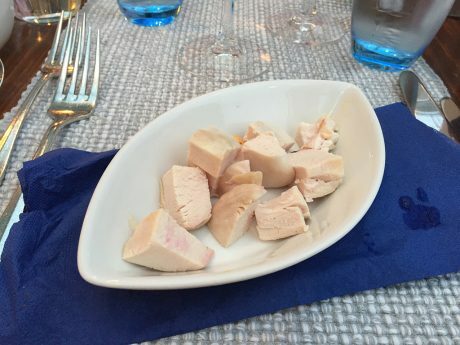 Chicken was, however, my menu of choice, of course! 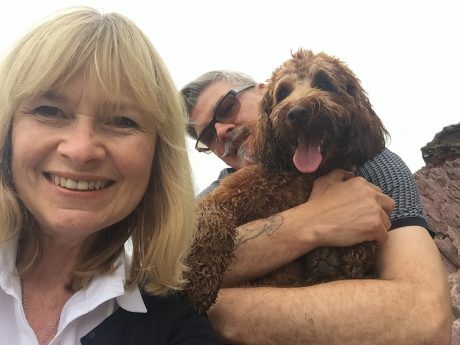 As it was our last evening at the hotel, we pushed the boat out and had pudding too – well, I say ‘we’, I mean Mum and Dad. 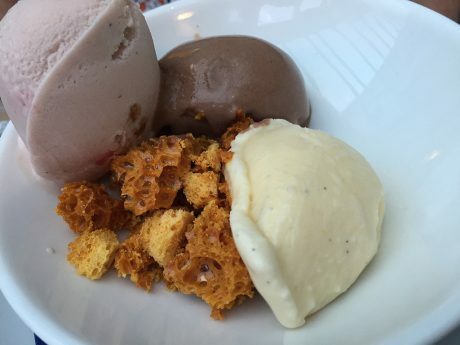 ‘Talland Bay Eton Mess’ and a ‘Selection of homemade Ice Creams with homemade Honeycomb’. Lush! 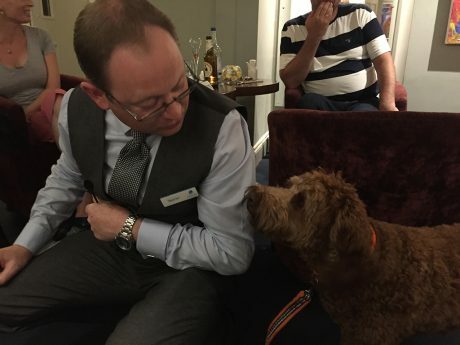 We rounded off the evening by joining all the HPs and their pooches in the lounge – this time the General Manager, Stephen, came to say hello, complete with doggie treats concealed upon his person. We liked Stephen! Lucy still had her eye on the treats that were sitting temptingly on the bar? Wait a minute, they were in Stephen’s pocket so… was that a twinkle in her eye that I spotted? Time to once again jump on Dad’s lap! 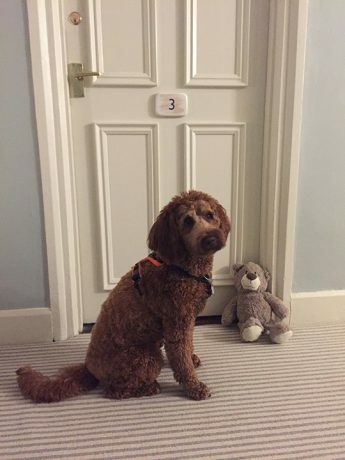 After yet another cosy night’s sleep, before I could implore my HPs to let sleeping dogs lie, Mum and Dad set too to pack up our faintly ridiculous amount of travel bags – shame that I just wore the same coat each day! and, finally, a cheerio to the very ‘Lovely Lucy’. 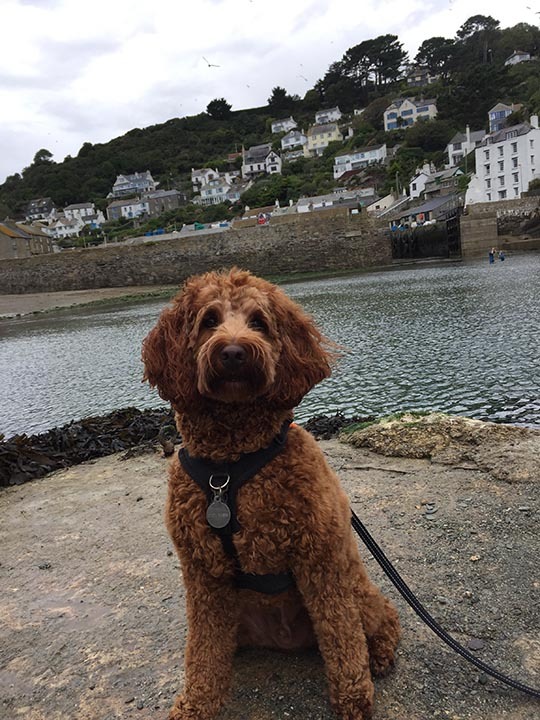 As friends of non-pooch owners, we do appreciate that not everyone wishes to share their social space with our four legged friends. (Hard to believe, we know, however, each to their own). 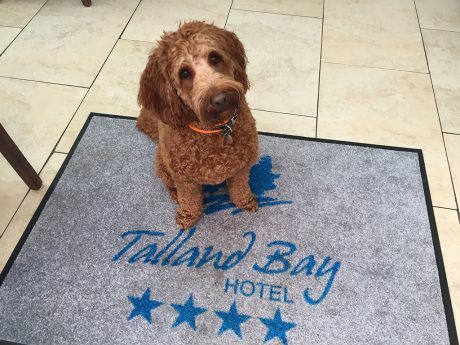 We appreciate, therefore, that hotels, B&Bs and pubs/restaurants with rooms must have a tricky time striving to create the perfect environment for everyone. 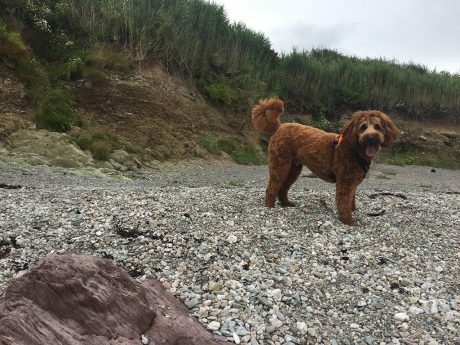 Based upon those venues that we feel, as a family, have struck a perfect balance, the experience has been critiqued from a highly-attached pet owner’s perspective (also a seasoned venue find agent), rating the comfort, convenience and inclusivity that we experienced when travelling with Basil. It’s a bit of fun, based on our own opinions but, hopefully, will be a useful insight to fellow discerning travellers. 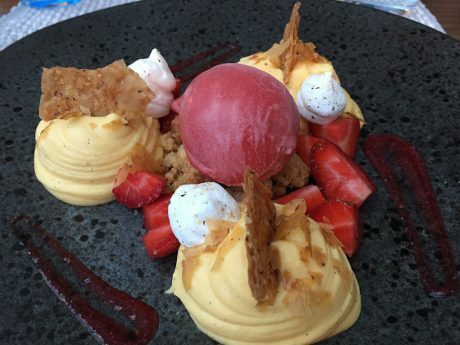 Fabulous – location and food! 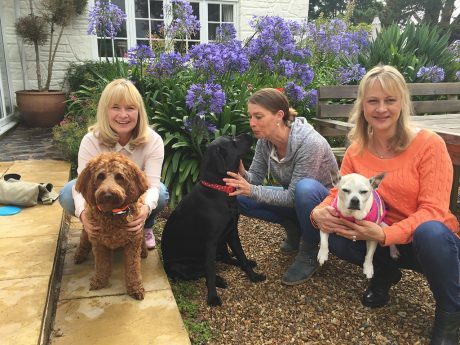 'If you'd like to make contact and stay at the venue with your pooch, my Mum has gathered together some details for you. 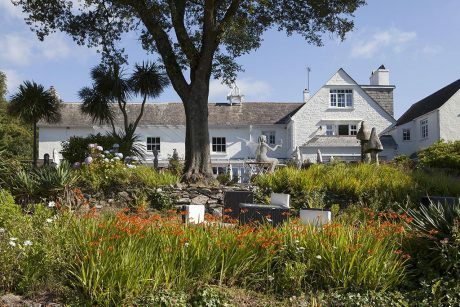 Upon booking, would you mind mentioning that you read the venue's review on the Travel With Basil site?